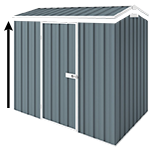 It is a popular 2.25m x 1.5m flat roof garden shed with a single hinged door. There are amazing possibilities to customise your shed and add a wide range of accessories and colours to choose from. You can increase the standard 1.8m wall height to 2.1m but this is just the beginning. You can change the hinged door to sliding door, add louvre window, skylight, shelving, tool holders and the list goes on. EasySHED Skillion Roof 2.25m x 1.5m Cream. 1. Great value for money and easy assembly construction. 2. The only two downfalls were the pre-attached door hinges, that I had to relocate; and the Door Bracing had to be modified, shortened to allow clearance with the Front Panel Doorjam, to allow the relief between the door and doorframe to close without conflict. 3. Apart from that; a very good shed at very affordable price! 4. Most important, my Wife is most pleased with her new gardening and tool storage shed!